SEE THE ENTRIES AND VOTE HERE! Download the “Our Planet. Our Future." Coloring Page and print it out. To make more of a positive impact on the planet, print on the back of paper with printing on only one side. Have a child you know (or yourself) color in the picture and feel free to add your own touches to it. Be sure the artist’s name and age is written on the entry as well. Take a digital picture or scan the finished art. Please only include the coloring page in the image. * Instagram or Facebook - Post the photo and tag @stayvocal / STAY VOCAL and use the hashtag #earthmonthcontest. If your pages are private, please use email. All entries must be posted or emailed by April 30, 2018 at 11:59 PM EST. Multiple submissions are welcome AND encouraged. During the first week in May, all qualified design entries will be shared on our Facebook Page for the SV community to vote on by “liking” it . The entry with the most total votes in each age group will be named the winner. So be sure to recruit your family and friends to vote too. Your entry will be showcased on the homepage of the STAY VOCAL website for 1 week in May or June. Your entry will be framed and hung inside the REUSE! Box Truck Tiny House at 1 major event this spring or summer. We reserve the right to reject any entries that are libelous, exploitative, or hateful, infringe on copyrights, plagiarize other entries, or do not meet the contest guidelines. By submitting your design, you acknowledge that SV retains the right to use it for marketing/promotional purposes. The winning entries will become the exclusive property of SV. Questions? Send an e-mail to info@stayvocal.com. 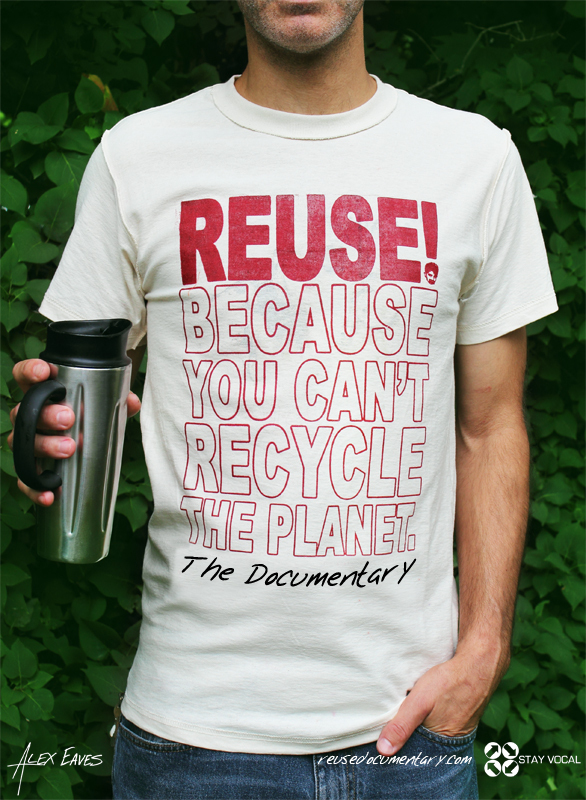 You can order the "Our Planet. Our Future." T-Shirt here.